Stringnote’sTalent Development Programme: the effective way to support you children’s growing creativity! All children are naturally interested in music. Nevertheless, a considerable number of grown-ups feel unable to sing or play an instrument. The logical question is: what happens with the musical ability of early childhood and why it does not easily flourish in adulthood? For a long time this phenomenon has fuelled the debate among psychologists and specialists in music pedagogy. There is now an emerging consensus that the period between 1 to 9 years old is essential to preserve innate creativity and musicality. Stringnote has designed an exclusive Talent Development Programme to protect, and develop, your children’s natural musical abilities. Stringnote’s Talent Development Programme starts with kids as young as age three and continues up to the age of nine. At the ages of 1 to 9 years old, children can effortlessly grow certain aspects of their innate musical abilities that will not be developed so easily at an older age. From the age 5 or 6 –the stage when most children start their systematic musical training- the intellectual part of the music learning process is boosted by the school curriculum but, probably related to that, their musical intuition (or commonly described as ‘musicality’) goes in the wane. Thus, most of the children -except the few ones that live in a special musical environment- find it much more difficult to learn to fluently ‘speak the language of music’ without impurities and problems the older they grow, as rhythmic and tuning difficulties start to surface and became an unwanted part of their personal profile. In a process that bears great resemblance to the acquisition of a ‘second language’ by a population of immigrants, the later your children learns the language of music, the less fluently they will be able to speak it; moreover, the detected problems will usually take much more time, and effort, to overcome. Stringnote has created a Talent Development Programme to address the critical musical needs of the early years, helping families to protect the natural musical abilities their children have. This programme, based on decades of research and teaching experience, has a variety of exercises and child-friendly activities that have been designed to support children’s talent, by providing the fun and formative activities your children need. Stringnote’s students not only learn to play an instrument, they also ‘speak’ the language of music and reinforce a whole array of abilities that are correlated to the development of musicality. 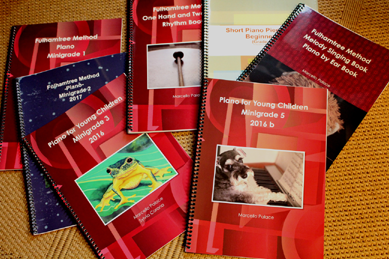 From the age of four most children are ready to start to learn piano with our exclusive Fulhamtree Method. Our piano course is divided in five minigrades that allow children to smoothly progress from the being absolute beginners to start preparing for the traditional ABRSM grade exams. Our academy also have extensive experience preparing older children for all the ABRSM grade exams. To receive more information about how to develop your children’s creativity, please contact Stringnote or register your interest in any of our courses.